I like the bracelet. Good quality. Fits great. Would recommend this product to everyone. In got the bracelet quickly and was very happy with it. Thanks over stock. 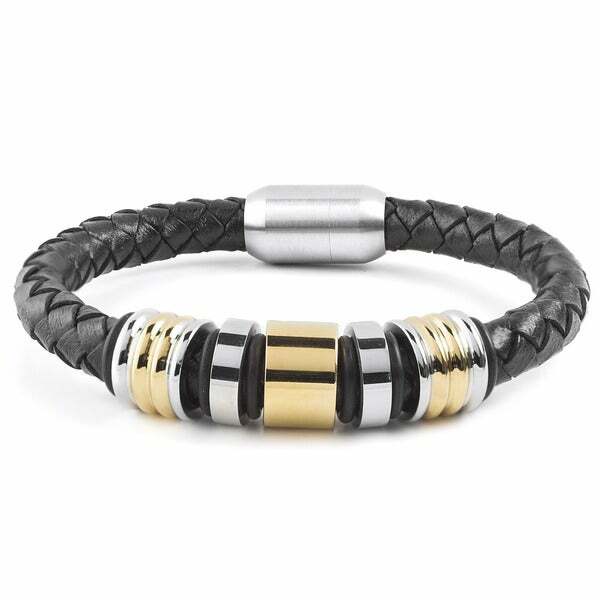 This eye-catching men's bracelet features a black braided leather bracelet with contrasting silvertone and goldtone grooved beads. A stainless steel brushed finish magnetic clasp makes the bracelet the perfect accessory for business or leisure. The bracelet measures 13 mm wide x 8.25 inches long x 13 mm thick. The weight of the bracelet is 34.7 grams. The bracelet encloses with a magnetic clasp. I really like the way this fastens together. It holds with a magnet that is strong enough to keep it from opening. The bracelet is sort of clunky, so if you are looking for delicate, this is NOT it. The silver/gold color combination is pretty. I really love the crucible bracelet. Glad I purchased it. Nice men's bracelet but more for the younger crowd. It attaches with a magnet at wrist but if your wrist is a little bigger it is a tight fit and pulls a few hairs now and then. I gave it as a set and she love it . A bit bulkier than I prefer, bought for a gift, but ended up not giving. "hi, can you engrave on the metal plate?" "is it possible to shorten the length of the bracelet, and if so how?" Hello Glennrye, due to the design it's unlikely that this bracelet can be shortened. Please let us know if you have additional questions. Thanks for shopping with us.